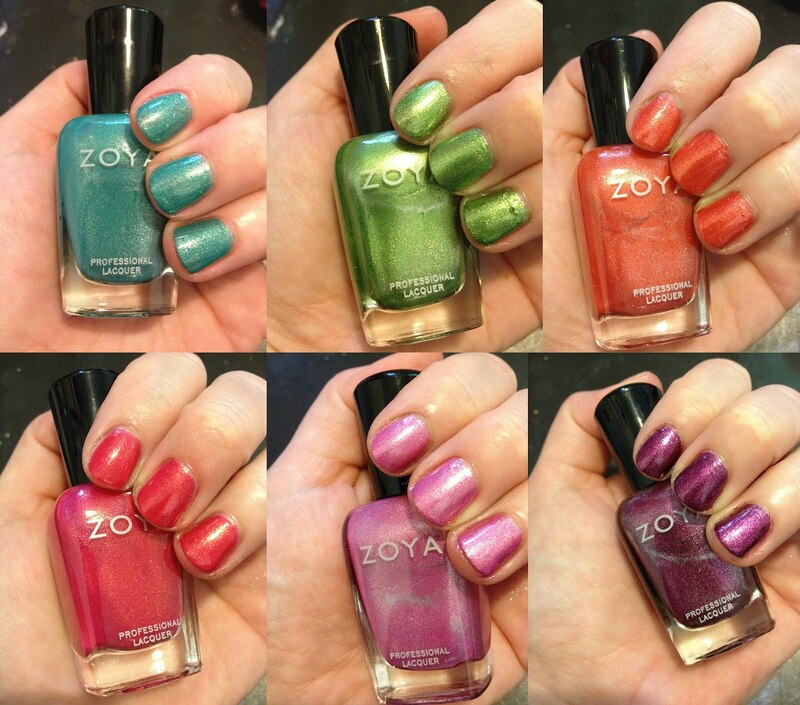 Zoya has two bold collections for Summer 2012 -- Beach and Surf. Stay tuned for Beach swatches, but read on for a look at the six shimmer-packed colors in Summer 2012's Surf collection. Everything here is seen with two coats. Rory. I love this color, and not just because it's my mom's name! This one is a hybrid of lilac and pink, shot through with gold and silver shimmer. I like that it changes in the light and has a bit of a foil finish. Kimber is my other favorite color from this collection. What a gorgeous raspberry hue with foil-like gold metallic shimmer! It actually reminds me a bit of China Glaze Raspberry Festival, although it's more pink than red. Definitely a great color for summer pedicures. Carly is actually my least favorite polish of this collection. It's a dark purple with red and silver sparkle. I found that it didn't apply well -- it was too streaky and goopy -- and the dark hue just doesn't seem to fit with the rest of the collection. I would prefer this in a fall collection with darker colors. Zuza is a gorgeous turquoise with gold and silver shimmer. I love this color, especially for a pedicure, but it's great on tips too! Meg is a light yellow-toned green with gold and silver shimmer. It's a pretty green, but not great on my skin tone. Fun for summer, though. Myrta is a bold orange-coral with gold and silver shimmer. I'm usually not an orange wearer, but I'm definitely adding this to my permanent collection. The Zoya Surf Collection retails for $48 at zoya.com. Each individual bottle is $8.